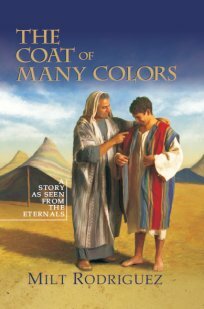 "A Story as Seen from the Eternals"
The eternal purpose of God beautifully described by using the Old Testament story of Joseph's coat of many colors. You will be presented with a simple explanation of God's plan and purpose for creation and the Church. What motivated God to create? You will see yourself in a completely new light as a believer, one who has been chosen before time. You will be able to see the beautiful description of the relationship between Christ and His beloved bride. What is your inheritance in Christ? See the glorious destiny that we all have access to as believers! Witness the absolutely breathtaking relationship between the Father and the Son! Order The Coat of Many Colors here. Note: You will always receive an email receipt if your order is completed. If you do not receive an email receipt, it means you didn't complete the order and will have re-order. Please follow these directions carefully. We suggest you print this out so you can read it and follow it step-by-step. 2 . You will be taken to the shipping menu. 3. Find your country in the drop down menu that says "Select Country." If you live in the United States, for instance, select United States. If you live in Puerto Rico, select Puerto Rico. If South Africa, click that. Brazil, select Brazil. If you live in the Philippines, select Philippines. 4. Skip the state dropdown menu if you don't live in the States or Canada. If you live in the States, select the state. If you live in Canada, select the province. 5. Type in the postal or zip code. South Africa is a 4 digit code. Others have 5 digits. 6. Click the "add shipping" button. 7. You will see your shipping options. Click on the one you want. 8. Follow ALL directions carefully. 9. On the "Payment Options" page, Paypal is the payment service we use for handling ALL credit card purchases. If you have a Paypal account, use the right side "Option." If you wish to use a credit card instead, use the left side "Option." Fill out ALL information and complete the order. Receipt of confirmation will be sent to your email address. It's that simple. IMPORTANT: If the order goes through, you will receive an email receipt. If you don't receive an email receipt, it means the order wasn't completed. So re-do. Note: Be sure to include your full mailing address for shipment of the book(s).